Arthritis is a joint disorder featuring inflammation. A joint is an area of the body where two different bones meet such as your elbows or knees. Ligaments hold the two bones together. The ligaments are like elastic bands, while they keep the bones in place your muscles relax or contract to make the joint move. Cartilage covers the bone surface to stop the two bones from rubbing directly against each other. The covering of cartilage allows the joint to work smoothly and painlessly. A capsule surrounds the joint. The space within the joint – the joint cavity, has synovial fluid. Synovial fluid nourishes the joint and the cartilage. The synovial fluid is produced by the synovium (synovial membrane) which lines the joint cavity. The function of a joint is to move the body parts that are connected by its bones. Arthritis literally means inflammation of one or more joints. Arthritis is frequently accompanied by joint pain. Joint pain is referred to as Arthralgia. 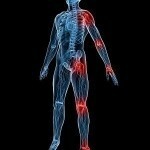 Over time many people start to feel pain and stiffness in their bodies. Sometimes their hands, knees or hips get sore and are hard to move. These people may have arthritis. If you have arthritis something goes wrong with the joint(s). What goes wrong depends on what type of arthritis you have. It could be that the cartilage is wearing away, a lack of fluid, autoimmunity (your body attacking itself), infection, or a combination of many factors. There are many types of arthritis over 100 and growing. The types range from those related to wear and tear of cartilage such as osteoarthritis to those associated with inflammation resulting from an overactive immune system such as rheumatoid arthritis. Together, the many types of arthritis make up the most common chronic illness around the world. The causes of arthritis depend on the form of arthritis. Causes include injury (leading to osteoarthritis), metabolic abnormalities, hereditary factors, infections, and Gout which results when crystals build up in the joints. Gout usually affects the big toe. Some arthritis such as rheumatoid arthritis and systemic lupus erythematosus can also be caused by unclear reasons. Osteoarthritis is the most common form of arthritis. This is the form that usually comes with age and most often affects the fingers, knees, and hips. Sometimes osteoarthritis follows an injury to a joint. For example, a young man might hurt his knee badly playing football. Then years after the knee has healed, he might get arthritis in his knee joint. 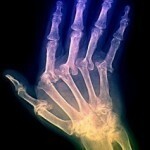 Rheumatoid arthritis happens when the body own defense system doesn’t work properly. It affects joints, bones, and organs–often the hands and feet. You may feel sick or tired, which can be accompanied by a fever. Infectious arthritis or (septic arthritic) is an infection in the synovial fluid and tissues of a joint. It is usually caused by bacteria, but could also be caused by fungi or viruses. Bacteria, fungi or viruses may spread through the bloodstream from infected tissue nearby, and infect a joint. Most susceptible people are those who already have some form of arthritis and develop an infection that travels in the bloodstream.